In return for time and selfless commitment, lifeboat services offer one of the most exciting, challenging and rewarding voluntary jobs in the UK. The UK’s coastline is one of our island nation’s defining features, but also one of its greatest safety hazards. If not for the hundreds of lifeboat teams working tirelessly and selflessly around the clock then its dangers would be all too apparent, as every day dozens of lives are saved by charity lifeboat services. With the demand for lifeboat services stronger than ever, the need for able and willing volunteers is ongoing and ever pressing. Joining a lifeboat crew is a rewarding job like few others – after all in terms of job satisfaction saving lives and helping the nation feel safe and secure is hard to beat. For those keen to join is it a case of hunting down your nearest RNLI station? 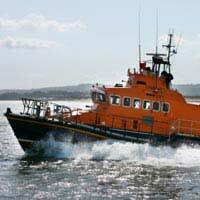 Lifeboat services have become synonymous with the Royal National Lifeboat Institution (RNLI), a 24 hour, 365 day service that has been operating now since 1824 and at present boasts over 230 lifeboat stations. But the RNLI is far from the only lifeboat organisation providing invaluable services around Britain’s coastline; it is just the most publicised and well known. There are around 60 other independent lifeboat units that provide the same high standard of 24-hour care. None of these are managed by the RNLI or the government, and rely on donations from the public, local businesses and money raised from their own fundraising events. Being a member of a lifeboat crew is far from an easy-going pursuit but one that tests nerve and resolve at all hours of the day. Emergencies at sea are more likely to occur in wild stormy weather in the middle of the night than on a bucolic Sunday afternoon and so lifeboat crew volunteers should be prepared for the worst. Being dragged out of bed before dawn on a freezing cold January morning to attend to a beleaguered fishing trawler battling 30 feet waves and gale force winds is not an unfamiliar situation for a lifeboat crew member. The commitment of volunteers is not only measured by the free hours lent to sea rescue but also in the time support back at base with training, maintaining equipment and even fundraising. Independent lifeboat crews, in particular, are expected to fulfil an ‘all-rounder’ role, so they might feature on the boats, in the watchroom windows and at charity fundraisers. Also the commitment it demands of volunteers could ultimately include risking ones life. Lifeboat crew members carry a lot of responsibilities on their shoulders and so need to fit for the job both physically and mentally, otherwise they not only put their own lives in peril but also those they are rescuing. Volunteers need to be over 18 years old - or over 17 with parents’ permission - and under 45 for the inshore lifeboats, and under 55 for the all weather lifeboats. They should also either live or work near a lifeboat station. Given the active nature of the role, volunteer crew need to be physically fit and undaunted by hard physical work. They also need to be healthy in mind and body, and duly demonstrate this with medical and eyesight tests. As a member of a crew, particularly one responsible for the lives of others, good team playing characteristics are also necessity. Good crew communicate well, are happy obeying orders, and able to get on well with others.